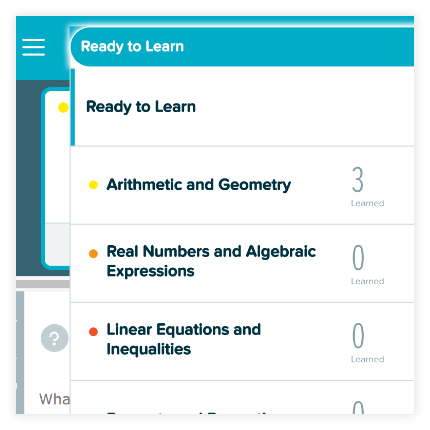 ALEKS helps students identify gaps, recommends what they need to learn next, and personalizes practice to gain mastery. As they work throughout the term, the personalized path in ALEKS prepares students for class. ALEKS provides them with structure and transparency so that students are working the most efficient path to success. Each student needs to refresh some concepts that they may have forgotten. ALEKS will identify these gaps and present students with topics that will better prepare them for the topics they are working to master. Throughout the course, students are presented with topics they are ready to learn. They won’t waste time on topics they already understand or get frustrated by topics for which they aren’t ready. ALEKS ensures that students have the prerequisite knowledge to be successful as the topics continue to build. If they are not ready, ALEKS will present the appropriate prerequisite topics to prepare them. On average, students have a 94.9% chance of learning the topics where ALEKS knows they are ready. As students work through each topic, ALEKS will determine how much practice they need to learn the material. This practice is individualized and helps them prepare for your exams. From our research and analytics, ALEKS asks that students get the correct answer a few times in a row to ensure that they really understand the topic. If you use a McGraw-Hill textbook, its corresponding author videos, eBook and other resources are easily available via our ALEKS 360 courses. You have the option to add your own resources to the Learning page as well. 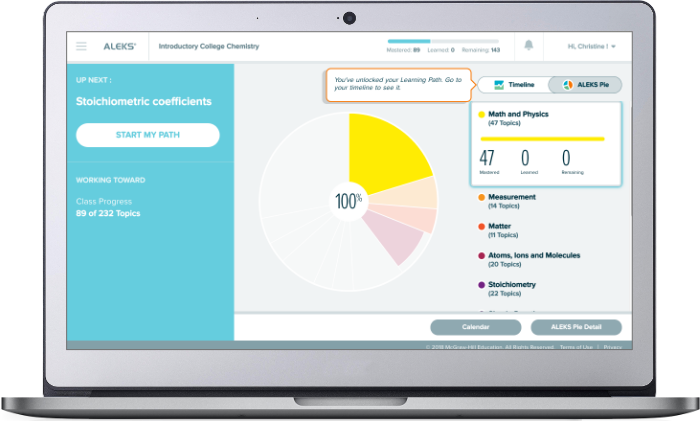 If you’ve created videos or other tools for students, you can tag them at the topic level within your ALEKS course so that students can benefit from your instruction even outside of the classroom.